Once a Swedish enclave, this residential area 5 miles north of the city's downtown and just a spit from the lake was the place I spent last week's Independence Day. American flags battled with Swedish and Turkish ones for prominence as locals sat and drank coffee and walked dogs making the most of a midweek break. Andersonville is actually in Edgewater, which is home to many poorer immigrants from the former Yugoslavia and Turkey, whereas the area surrounding Clark Street in between the Red Line 'El' stops at Bryn Mawr (meaning big hill in Welsh, there are no big hills around here incidentially) and Berwyn is more affluent. Unbelievably this area was a large cherry orchard around the mid 1850's but after the Great Chicago Fire of 1871, wooden homes were outlawed in Chicago so Swedish immigrants with a proclivity for using wood in their buildings moved further north and before long the area around Clark Street was dominated by Swedish businesses. 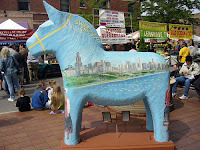 Some 2nd and 3rd generation Swedes remain and the area still celebrates its past with an annual Midsommarfest and a Swedish American Museum (5211 N Clark) that was opened to the public in a ceremony attended by King Carl XVI Gustaf of Sweden in 1961. 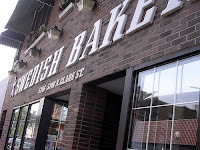 Today Andersonville like other popular neighbourhoods is home to a diverse assortment of devoted residents and businesses, including one of Chicago's largest gay and lesbian communities, it also has a large collection of Middle Eastern restaurants and bakeries, I am sure this is only a coincidence! However the yellow and blue flag can still be seen outside Erickson's Deli (5250 N Clark), Wikstrom's Gourmet Foods (5217 N Clark), Svea Restaurant (5236 N Clark) and the famed Swedish Bakery (5348 N Clark), which was unfortunately closed "to celebrate the declaration of Independence" the day we were there! In Andersonville you can find a number of theatre's including the Griffin Theatre and The Quest People's Theatre, described as the 'theatre with a conscious,' and the Chicago Chamber Choir. 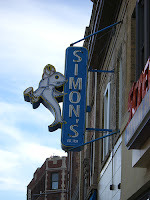 For a pint of Swedish Pripp's Lager head to Simon's Tavern, which dates back to 19 30 and has had a colourful history. The original owner (a Swedish immigrant named Simon Lundberg) became a bootlegger during Prohibition and cashed people's paychecks whilst sitting in a bullet-proof booth, which is still there. The back bar is modelled on an American WWI war ship and the now owner of this friendly bar will give you a tour of the place if you ask nicely. For a bite there is Andies Mediterranean Restaurant but better is Chicago institution Reza's whose Persian restaurant downtown is only a block away from where I live. It doesn't matter though as they are next door to each other, you can sit outside both and watch the dog-in-handbag set wal k by and you'll find cracking finger-licking Middle Eastern food at both locations. Someone told me that there are more independently owned shops in Andersonville than any other Chicago neighbourhood, which makes nosing in shop windows far more of a surprise. Old time watch shop Erickson's, chocolate heaven bon bon, wine merchant In Fine Spirits and quirky gift shop Green Sky will all entice. 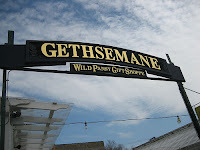 The streets that head out towards Edgewater Beach such as W Catalpa Ave, W Balmoral Ave and W Berwyn Ave are tree-lined with family homes but it is Clark Street where most of the action is with the vast Gethsemane Garden Center (5739 N Clark), a real treasure trove for urban gardeners at one end, the neon lighted Philadelphia Church in the middle (I can't find an explanation of why this is here) and the Swedish flag painted water tower at the other. 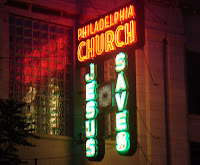 L to R: Jesus Saves (as long as you are from Philadelphia! 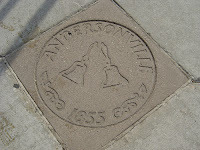 ); Andersonville pavement slab; Gethsemane garden centre.